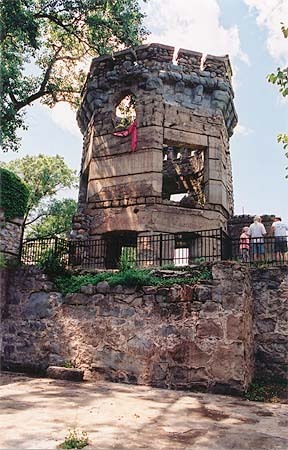 The remnants of a castle are on a hill in groton, massachusetts overlooking main street, and the huge castle gate is directly on mani street with a guard house. The "skeleton" of the castle are on gibbet hill, private land, but can be seen from both main street and, more closely route 4 behind lawrence academy. you can see the castle from route 40 not route 4. Here is a little more info about the Bancroft Castle in Groton, MA. - The story (or rumor) goes that the man who built it was building it for his wife, and she died when he was halfway finished. He never fininshed the castle. My husband and I snuck up there one day (I'm from the next town over, Westford, and I've always been fascinated by this castle). It is privately owned, but I made it without anyone seeing me. It is the skeleton, if you will, of a castle, but it has a date of 1906 made of stones set into the frame of the castle. I'm not sure what that means, but that's really all we could find. I used to live right next to this castle when I was a kid. My brother and me played in its ruins all the time. I believe it was built in the early 1900's (1903) The owner was Major General William A. Bancroft. (Harvard 1878, three terms as Mayor of Cambridge, Massachusetts, owner of the Boston Elevated Railway Company) I understand that it was his hunting lodge and later became a tuberculosis hospital. The structure was destroyed by fire in 1930. The ruins are now part of the Gibbet Hill Angus Farm. I understand that there is much interest in preserving the land and the old castle has even been opened a couple times for curiosity seekers. It is however, on private land, with a whole bunch of big mean looking angus staring at you. (I was scared to death as a kid) Theres alot of pictures at the town of Groton website: http://www.townofgroton.org/xml/community/citizens_gallery/ I too would be interested in knowing anymore about it. I'm sure the Groton Public library must have some info on it. I would include some of the photos but I'm not sure of copyright. I came across your website while doing some research on Gibbet Hill in Groton. I'm sorry to tell you that the Bancroft "Castle" is not the ruins of a castle. General William A. Bancroft built a stone "bungalow" as a summer home, probably in 1905. It had a fieldstone tower. It was thought that he wanted to turn the structure into a stable if he ever built another home on the property, which he never did (supposedly, he planned to build a "castle-like" mansion.) It was sold in 1918 and was turned into a private hospital. When the bungalow burned down on July 4, 1930 (the fire was caused by fireworks), all that remained was the tower. Anyone who is interested, and in the Groton area, should stop by the library. We have a small file of articles about the "castle", with some pictures. By the way, the "castle" is indeed on private property. I thought you might like an update on the Bancroft Estate in Groton Massachusetts. The "Castle" (as the town knows it) land is now open to the public. The whole property was recently saved from imminent development by Steven Webber, a local internet baron. He put more than 500 acres of land into conservation trust and later opened a very successful restaurant at the base of the hill. The restaurant has a website with history and pictures.